The 'mother church of world Methodism' was opened by John Wesley in 1778, and Wesley lived in a house in the chapel grounds. There is a Methodist museum in the chapel crypt. Wesley's Chapel is located directly across City Road from the historic non-Conformist burial ground of Bunhill Fields where you will find the tombs Wesley's wife Susanna as well as that of engraver William Hogarth and poet John Bunyan, Daniel Defoe, and Isaac Watts, among other well-known figures. In 1778 John Wesley asked architect George Dance the Younger, the Surveyor for the City of London, to design a chapel on City Road, opposite the ancient non-conformist burial ground of Bunhill Fields. and very close to his first chapel, The Foundery. Wesley was extremely pleased with the result, calling Dance's design 'perfectly neat but not fine', in other words, serviceable and not too ostentatious. The chapel featured galleries supported on timber ships' masts given by King George III. Wesley would probably not apply the same description to the chapel we see today, for in 1891 the chapel was transformed beyond all recognition in honour of the centenary of Wesley's death. 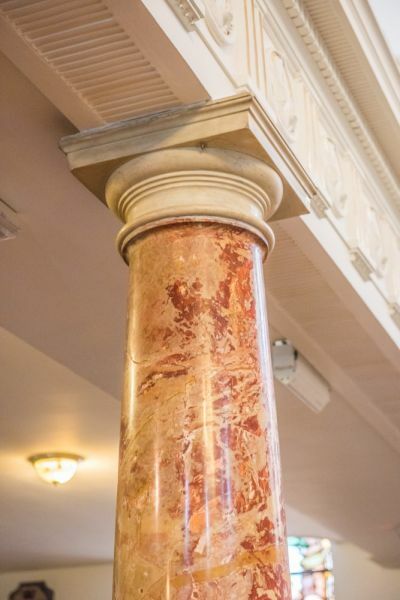 Methodist churches from around the world gave money to install new pillars made of French jasper in place of the timber pillars, and stained glass windows were added in addition to oak pews. An organ was installed in 1882 and replaced with the current organ 9 years later in 1891. The organ was converted to run on electricity in 1905. 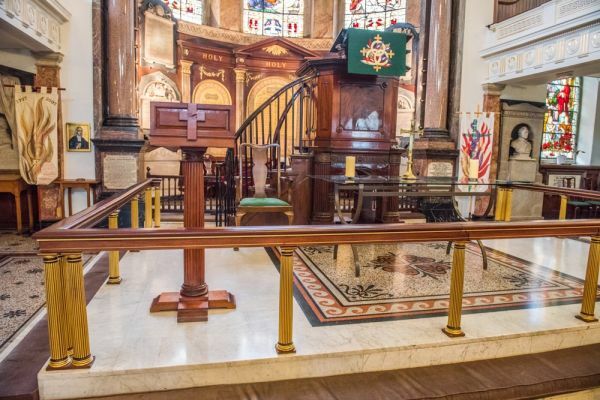 A more modern addition is a set of curving communion rails given by former Prime Minister Margaret Thatcher, who was married here in 1951. The result is a richly decorated interior that is unlike any other Methodist chapel I've ever seen. It has more in common with Catholic church interiors than most other Wesleyan chapels, with colourful stained glass and opulent materials. No wonder it is known sometimes as the Methodist Cathedral. Adjoining the chapel is a recreation of The Foundery Chapel, Wesley's original place of worship in London. 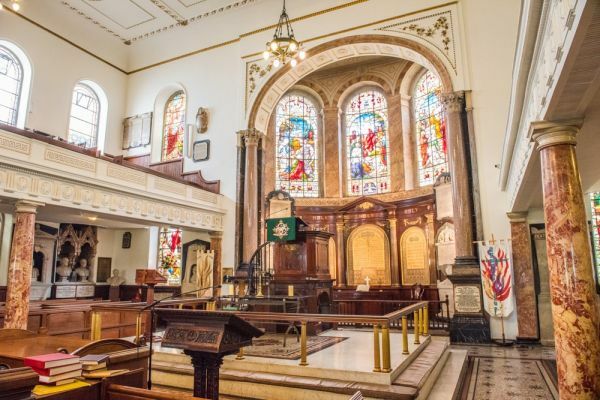 Some of the original fittings and furnishings are intact, such as Charles Wesley's original organ and several original pews. Behind the chapel is a small Methodist burial ground preserved as a garden area. Here you will find John Wesley's grave and that of one of his sisters. The burial ground is a peaceful place, though it is overlooked by modern office buildings, providing a rather odd contrast to the quiet garden space. In the chapel crypt is a fascinating museum dedicated not only to Wesley and his life but to Methodism around the world. Trace the role that Methodism played in Britain's social history and the adventurous travels of Methodist missionaries abroad. 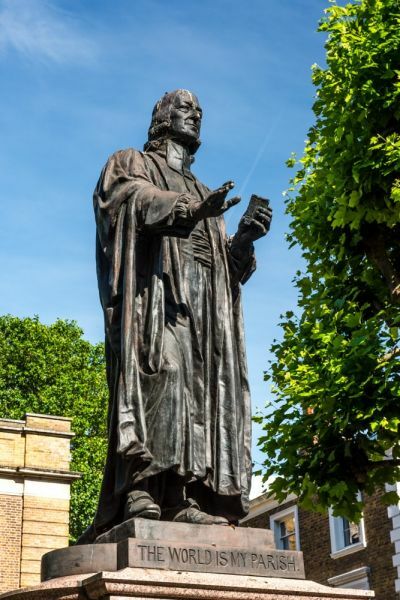 Items linked to Wesley himself include the pulpit that he used in The Foundery Chapel, as well as a portable lectern and a collection plate. One rather poignant item is a quill pen used by Wesley to correspond with anti-slavery campaigner William Wilberforce. 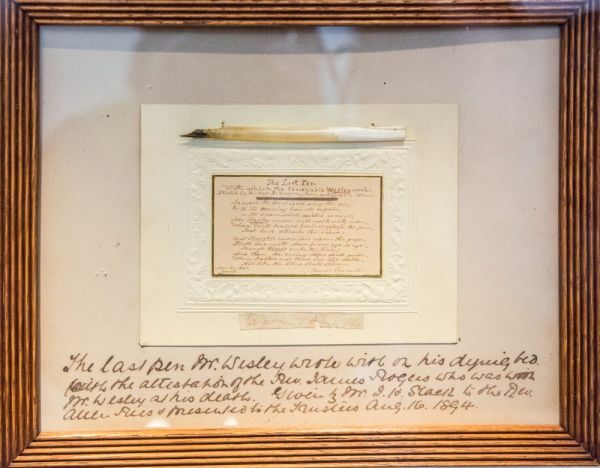 Wesley is thought to have used this pen to write his last letter before he died. This is one of a pair of houses built on the chapel site within a year of its construction. The houses were intended to be a home for Wesley and his family, their servants, and a residence for visiting preachers and their families. Even without its connection to Wesley, the house is a wonderful example of a Georgian townhouse. Admission to Wesley's House is by guided tour only. Simply enquire of the attendant inside the chapel or, if you don't find anyone there, ask at the museum. Be aware that the house has several very narrow stairs so it really does require good mobility to access all the floors. Our tour guide was extremely friendly and informative and really helped bring the house to life with stories about Wesley and his family during their time in London. One item that caught our eye was an exercise 'horse', a peculiar-looking bellows atop a wooden chair. Wesley would use the exercise chair to emulate the effects of riding a horse during the long winter months when he was not out and about on his preaching travels. 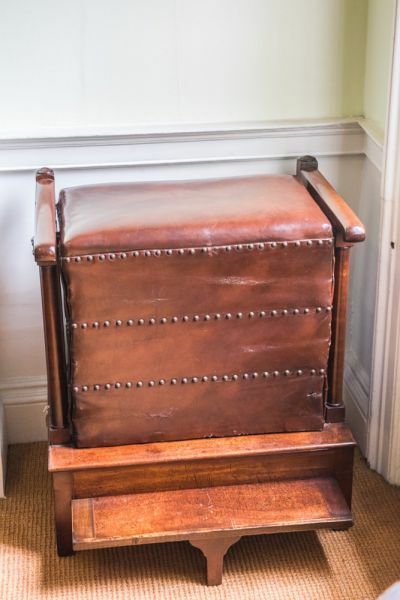 He would exercise on the chair for 30 minutes every day, bouncing up and down against the pressure of the bellows to simulate the exertion of riding a horse. The tour takes in the ground floor parlour, basement kitchens, and bedrooms on the upper floors. Many items remain from Wesley's time here, and other items have been brought back to the house after being sold. 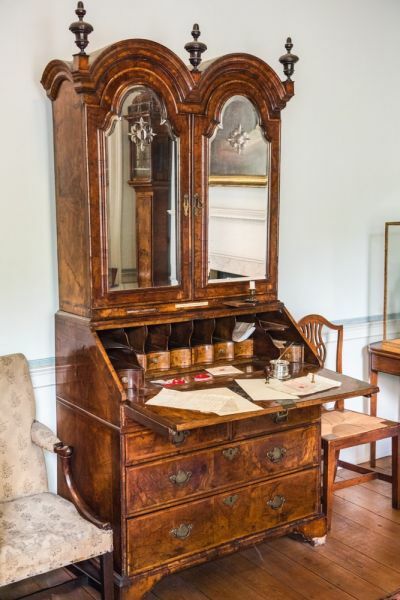 Some of the furniture is reproduction, of the same sort that Wesley would have used. The study still holds Wesley's collection of books, most of them signed by Wesley. Here you will find an electricity generator, used by Wesley to treat depression. 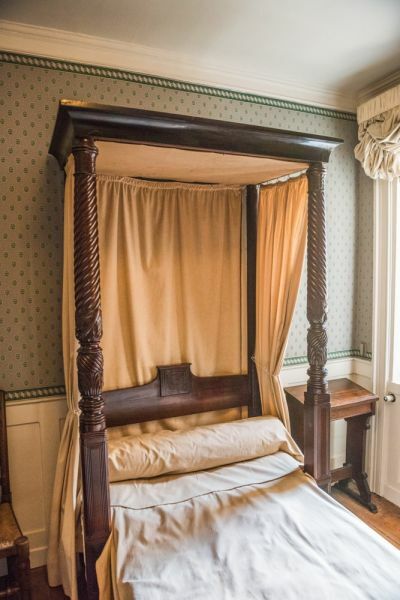 As part of the house tour you can see the room where Wesley died in 1791. After his death, the house continued to be used as a residence for visiting preachers but was converted into a museum in the 20th century. 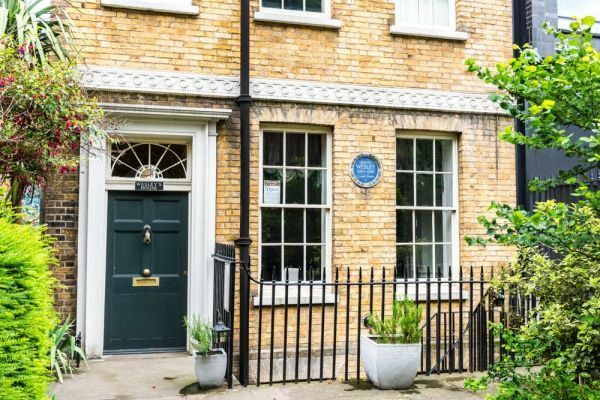 A blue plaque commemorating Wesley is set into the west exterior wall, facing City Road. I had passed by Wesley's Chapel several times and was always intrigued but never made the effort to visit. That was my loss, for Wesley's Chapel and House is an absolute delight to explore. The volunteer guide who pointed out the major chapel features was wonderfully friendly and informative, and the house really helped gain an insight into Wesley's life. Highly recommended. 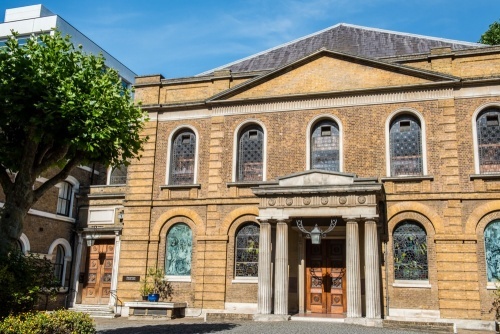 Wesley's Chapel is located between Old Street and Moorgate tube stations, with Old Street being marginally closer. Simply walk straight down City Road from the station exit and you will find the Chapel on your left.